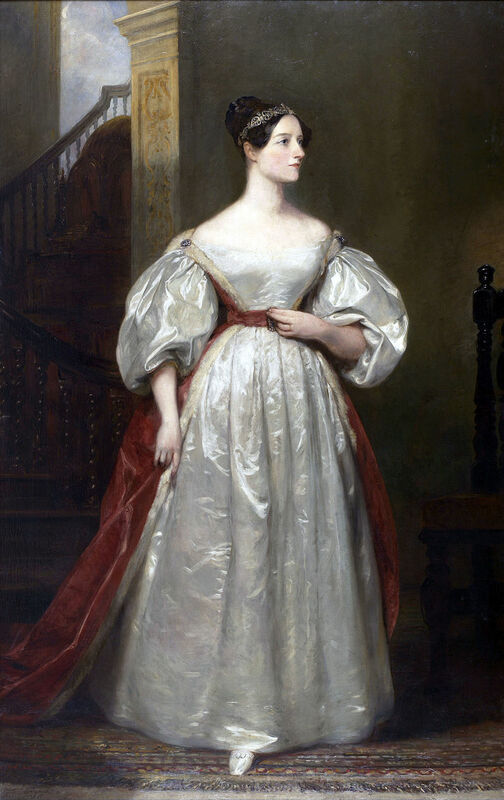 Today is the birthday (1815) of Augusta Ada King-Noel, Countess of Lovelace, known commonly as Ada Lovelace, an English mathematician and writer, chiefly known for her work on Charles Babbage’s proposed mechanical general-purpose computer, the Analytical Engine. She was the first to recognize that the machine had applications beyond pure calculation, and published the first algorithm intended to be carried out by such a machine. As a result, she is often regarded as the first to recognize the full potential of a “computing machine” and the first computer programmer. Whether or not she actually wrote the algorithms published under her name is under dispute, so the title of “first computer programmer” may not be warranted. However, what is not questioned is her insight that computing machines could be used for more than working with numbers. She realized that if you used numbers to represent other things, such as letters of the alphabet, computing machines could be used for a host of applications beyond numerical calculation. In essence, her insight is the foundation of all modern digital computers, although neither she nor Babbage ever put the theory into practice. 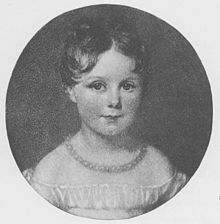 Ada Lovelace was the only legitimate child of the poet Lord Byron, and his wife Anne Isabella Milbanke (“Annabella”), Lady Wentworth. All of Byron’s other children were born out of wedlock to other women. Byron separated from his wife a month after Ada was born and left England forever four months later. He died of disease in the Greek War of Independence when Ada was 8 years old. 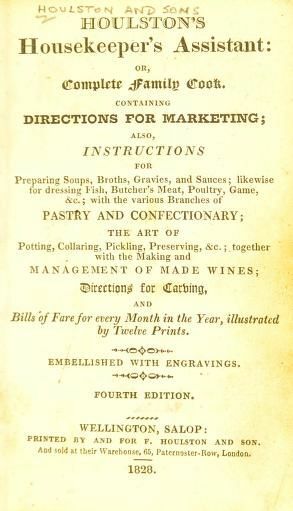 Her mother remained bitter and promoted Ada’s interest in mathematics and logic in an effort to prevent her from developing her father’s perceived “insanity” (that is, his inveterate wandering, Romanticism, and inclination towards poetry). Despite this, Ada remained interested in Byron and was, upon her eventual death, buried next to him at her request. She was often ill in her childhood. 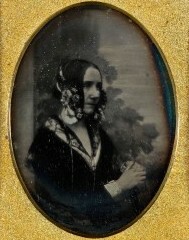 Ada married William King in 1835. King was made Earl of Lovelace in 1838, and Ada in turn became Countess of Lovelace. Her educational and social desires brought her into contact with scientists such as Andrew Crosse, Sir David Brewster, Charles Wheatstone, Michael Faraday and also with Charles Dickens. Lovelace described her approach as “poetical science” and herself as an “Analyst (& Metaphysician).” When she was a teenager, her mathematical talents led her to a long working relationship and friendship with fellow British mathematician Charles Babbage, also known as “the father of computers”, and in particular, Babbage’s work on the Analytical Engine. http://www.bookofdaystales.com/charles-babbage/ Lovelace first met him in June 1833, through their mutual friend, and her private tutor, Mary Somerville. Between 1842 and 1843, Ada translated an article by Italian military engineer Luigi Menabrea on his ideas for an Analytical Engine, which she supplemented with an elaborate set of notes, simply called “Notes.” These notes contain what many consider to be the first computer program—that is, an algorithm designed to be carried out by a machine. She also developed a vision of the capability of computers to go beyond mere calculating or number-crunching, while many others, including Babbage himself, focused only on those capabilities. Her mindset of “poetical science” led her to ask questions about the Analytical Engine (as shown in her notes) examining how individuals and society relate to technology as a collaborative tool. She died of uterine cancer in 1852 at the age of 36. Throughout her life, Lovelace was strongly interested in scientific developments and fads of the day, including phrenology and mesmerism. After her work with Babbage, Lovelace continued to work on other projects. In 1844 she commented to a friend Woronzow Greig about her desire to create a mathematical model for how the brain gives rise to thoughts and nerves to feelings (“a calculus of the nervous system”). She never achieved this, however. In part, her interest in the brain came from a long-running pre-occupation, inherited from her mother, about her ‘potential’ madness. As part of her research into this project, she visited the electrical engineer Andrew Crosse in 1844 to learn how to carry out electrical experiments. In the same year, she wrote a review of a paper by Baron Karl von Reichenbach, “Researches on Magnetism,” but this was not published and does not appear to have progressed past the first draft. In 1851, the year before her cancer struck, she wrote to her mother mentioning “certain productions” she was working on regarding the relation of mathematics and music. Forget this world and all its troubles and if possible its multitudinous Charlatans—every thing in short but the Enchantress of Number. Some historians think that Babbage was calling Lovelace the “Enchantress of Number” which only goes to show how stupid some people are. I’d count them among Babbage’s “multitudinous Charlatans” for not being able to see that Babbage is calling numbers an enchantress, not Lovelace. In 1840, Babbage was invited to give a seminar at the University of Turin about his Analytical Engine. Luigi Menabrea, a young Italian engineer, and the future Prime Minister of Italy wrote up Babbage’s lecture in French, and this transcript was subsequently published in the Bibliothèque universelle de Genève in October 1842. Babbage’s friend Charles Wheatstone commissioned Lovelace to translate Menabrea’s paper into English. She then augmented the paper with notes, which were added to the translation. Lovelace spent the better part of a year doing this, assisted with input from Babbage. These notes, which are more extensive than Menabrea’s paper, were then published in Taylor’s Scientific Memoirs under the initialism AAL. 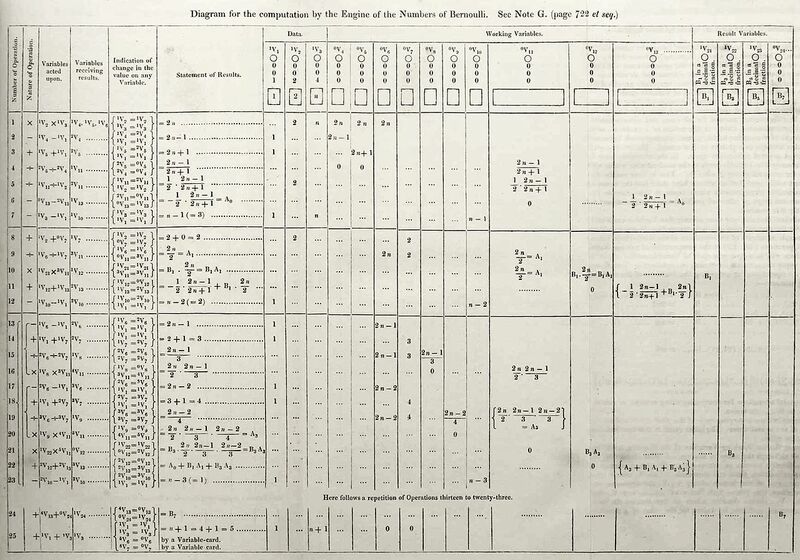 Lovelace’s notes were labelled alphabetically from A to G. In note G, she describes an algorithm for the Analytical Engine to compute Bernoulli numbers. 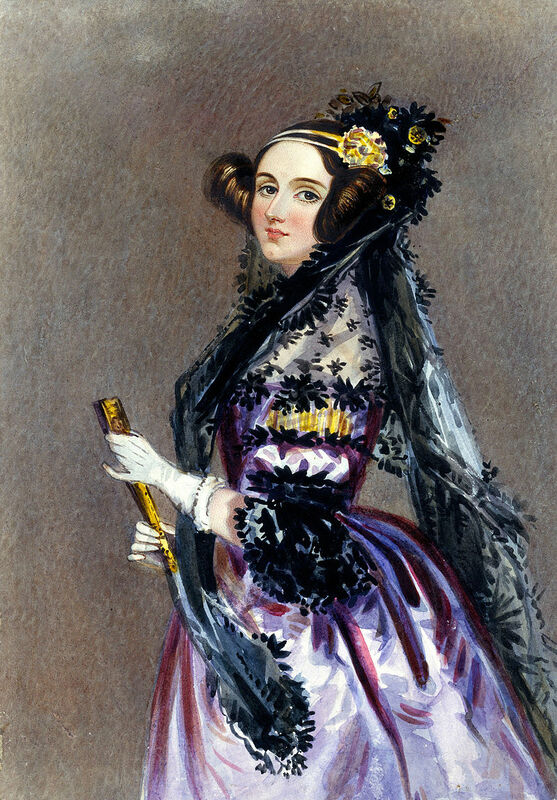 It is considered the first published algorithm ever specifically tailored for implementation on a computer, and Ada Lovelace has often been cited as the first computer programmer for this reason. The engine was never completed so her program was never tested. Explaining the Analytical Engine’s function was a difficult task because even many other scientists of the day did not really grasp the concept and the British establishment was uninterested in it. Lovelace’s notes even had to explain how the Analytical Engine differed from the original Difference Engine. Her work was well received at the time. Michael Faraday described himself as a supporter of her writing. The notes are around three times longer than the article itself and include (in Section G), in complete detail, a method for calculating a sequence of Bernoulli numbers with the Engine, which could have run correctly had Babbage’s Analytical Engine been built. (Only his Difference Engine has been built, completed in London in 2002.) Based on this work Lovelace is now widely considered the first computer programmer and her method is considered the world’s first computer program. Lovelace and Babbage had a minor falling out when the papers were published when he tried to leave his own statement (a criticism of the government’s treatment of his Engine) as an unsigned preface—which would imply that she had written that also. When Taylor’s Scientific Memoirs ruled that the statement should be signed, Babbage wrote to Lovelace asking her to withdraw the paper. This was the first that she knew he was leaving it unsigned, and she wrote back refusing to withdraw the paper. The historian Benjamin Woolley speculated that: “His actions suggested he had so enthusiastically sought Ada’s involvement, and so happily indulged her … because of her ‘celebrated name’.” Their friendship recovered, and they continued to correspond. On 12 August 1851, when she was dying of cancer, Lovelace wrote to him asking him to be her executor, though this letter did not give him the necessary legal authority. Part of the terrace at Worthy Manor, the Lovelace country estate, was known as Philosopher’s Walk, as it was there that Lovelace and Babbage were reputed to have walked while discussing mathematical principles. [The Analytical Engine] might act upon other things besides number, were objects found whose mutual fundamental relations could be expressed by those of the abstract science of operations, and which should be also susceptible of adaptations to the action of the operating notation and mechanism of the engine…Supposing, for instance, that the fundamental relations of pitched sounds in the science of harmony and of musical composition were susceptible of such expression and adaptations, the engine might compose elaborate and scientific pieces of music of any degree of complexity or extent. This analysis was an important development from previous ideas about the capabilities of computing devices and anticipated the implications of modern computing 100 years before they were realized. Walter Isaacson ascribes Lovelace’s insight regarding the application of computing to any process based on logical symbols to an observation about textiles: “When she saw some mechanical looms that used punchcards to direct the weaving of beautiful patterns, it reminded her of how Babbage’s engine used punched cards to make calculations.” Of course, those of us who were computing in the 1970s know the trials and tribulations of punchcards. Youngsters with smart PCs have no idea. Ada saw something that Babbage in some sense failed to see. In Babbage’s world his engines were bound by number…What Lovelace saw—what Ada Byron saw—was that number could represent entities other than quantity. So once you had a machine for manipulating numbers, if those numbers represented other things, letters, musical notes, then the machine could manipulate symbols of which number was one instance, according to rules. It is this fundamental transition from a machine which is a number cruncher to a machine for manipulating symbols according to rules that is the fundamental transition from calculation to computation—to general-purpose computation—and looking back from the present high ground of modern computing, if we are looking and sifting history for that transition, then that transition was made explicitly by Ada in that 1843 paper. Though Lovelace is referred to as the first computer programmer, some biographers and historians of computing claim otherwise. All but one of the programs cited in her notes had been prepared by Babbage from three to seven years earlier. The exception was prepared by Babbage for her, although she did detect a ‘bug’ in it. Not only is there no evidence that Ada ever prepared a program for the Analytical Engine, but her correspondence with Babbage shows that she did not have the knowledge to do so. Add to this statement her obviously prescient insight that “computing machines” could go far beyond algorithms for number crunching and you have the measure of her contribution to modern computer science. Boil the eggs hard, take out the yolks entire, and cut the whites in slips, with some onions and mushrooms. Fry the onions and mushrooms, put in the whites, and turn them about a little; then pour off the fat, if there be any; flour the onions, &c. and put to them a little good gravy. Boil this up, put in the yolks of the eggs, and add a little pepper and salt; then let the whole simmer for about a minute, and serve it up. What this amounts to is a dish of boiled egg yolks in a mushroom and onion gravy containing sliced egg whites. Not that complicated, and would make a nice brunch dish if you are into that sort of thing.